A jukebox is a coin-operated machine that plays music from a record or compact disc (CD) once a selection is made. Originally called nickelodeons, the term jukebox did not appear until the late 1930s and its origins are in dispute. Some believe it is derived from the African word jook, meaning to dance. Others link it to the juke joints—roadside bars located in the South and frequented by African Americans—that were popular at that time. In its height of popularity in the mid-1950s, approximately 750,000 jukeboxes were in use across the United States. That number dipped during the 1970s and 1980s, but with the advent of CD technology and a growing antiques market, the number of jukeboxes presently in use is a solid 250,000. In 1877, Thomas Edison invented the phonograph, a coin-operated music machine that played music from a wax cylinder. On November 23, 1889, Louis Glass installed a coin-operated phonograph in his Palais Royale Saloon located in San Francisco. It was called "nickel-in-a-slot" because that was the amount of money needed to make a selection. Later, the term was shortened to nickelodeon. In 1906, John Gabel invented the "Automatic Entertainer," a music machine that replaced the wax cylinder with 78-rpm disc recordings and offered several selections of records that could be played. Gabel's Automatic Entertainer dominated the market until the mid-1920s. The jukebox remained something of a novelty arcade item until the invention of the electric amplifier. Without amplification, it was impossible for a large group of listeners to enjoy the music played by the jukebox. When Automated Musical Instruments Inc. (AMI) developed an amplifier in 1927, the popularity of the jukebox surged. It was especially popular in the illegal speakeasies of the Prohibition Era because it provided a cheap form of entertainment. AMI sold 50,000 of its amplified machines in one year, bringing to life the age of the jukebox. During the Depression, record sales plummeted from $75 million in 1929 to $5 million in 1933. The growing popularity of the jukebox and the purchases by store owners that went along with it resurrected the waning music business, and by 1938, the industry had resurfaced at $25 million in sales. By 1940, there were 400,000 jukeboxes in use in the United States. Three names were made during the 1940s and they remain synonymous with the juke-box industry. Seeburg, Rock-Ola, and Wurlitzer all manufactured jukeboxes at this time. Each company began by creating juke-boxes in the likeness of the radio, but in the 1940s, jukebox design came into its own with the help of a few great designers employed by the companies. Perhaps the best known is Paul Fuller, the designer behind the Wurlitzer models that pushed Wurlitzer to the top of the industry in the late-1940s and 1950s. With the use of rotating lights, art deco styled cabinets, and bubble tubes, Wurlitzer models were works of art. The most popular design was the Wurlitzer 1015 that was introduced in 1946 and became the biggest selling jukebox in history. In its original run, it sold a total of 56,246 boxes. In 1948, Seeburg offered its own innovation to the jukebox industry with the introduction of its Select-O-Matic 100, the first jukebox to include 100 selections. This technology allowed popular music to be played in the same venue as regional country, folk, jazz, and blues music—a variety that changed the music industry and its development completely. By 1956, jukeboxes with 200 selections were being manufactured. Just as the proliferation of fast-food restaurants such as McDonald's and chain restaurants such as Houlihan's spelled doom for mom-and-pop establishments, the taped music played in the new gathering places signaled the end of the jukebox's glory. The introduction of cassette tapes and the declining production of 45-rpm records also added to the decreased popularity of jukeboxes. By the mid-1970s, the number of jukeboxes had fallen to 225,000. The jukebox industry waned through the 1980s until a growing antiques market and new technology revived the industry. Refurbished classic models are collectables, and a Wurlitzer 1015 that first sold for $750 is now approximately $12,000. CD technology has breathed new life into the primary market, creating new models that house 100 CDs totaling 1,000 song selections. Since the late 1980s, the number of jukeboxes has creeped back up to 250,000. A remake of the Wurlitzer 1015 is even being manufactured by Wurlitzer of Germany. Rock-Ola machines are also still produced as well. Each jukebox is comprised of 700-800 different components, including wood cabinetry; injection-molded plastic pieces; electronic stereo equipment such as amplifiers, woofers and tweeters, turntable or disk player; lighting; mirrors; records or compact disks; and the selection mechanism. In some cases, the bulk of the components are purchased from outside suppliers. Other manufacturers create everything in-house except the records or compact disks. The cabinets are constructed of multiple layers of wood, usually Italian poplar, Finland ply, walnut, olive ash, alder, maple, and Corinthian burl elm. Metal parts such as the grills, trim, and money changers are cast from metal dies. The grills and trim are plated with copper, nickel, and polished chrome. Some jukeboxes are replicas of original designs, others are original. In either case, a designer creates a prototype, or sample, of the jukebox to be manufactured using CAD/CAM software. The company produces a half dozen or so to place in restaurants or taverns. The prototypes are test-marketed for several months before they are approved for mass production. Although many of the components are machine-crafted, each jukebox is hand-assembled. Therefore, the assembly line moves very slowly. The factory can produce approximately 10 jukeboxes per day. Plywood or solid wood sheets are cured and molded into the basic jukebox shape. Slots are cut into the sheets for the side metal trim. The cabinets are varnished and stained. After the varnish and stain has dried, the side metal trim is riveted onto the cabinet. All sheet metal parts are laser cut. The florescent lighting fixtures and bubble tubes are installed in the cabinets. A polarized light system allows the colors to change. The electronic components are screwed to the inside of the door. The door is then attached to the cabinetry. The record/compact disk storage and changer mechanisms are installed inside the cabinetry. After the jukebox is completed, it is sent to the testing room for 24-48 hours. Inspectors check all of the components: lighting, sound, selection, money changing, etc., to insure that they are working properly. A jukebox is made up of 700-800 different components, including wood cabinetry; injection-molded plastic pieces; electronic stereo equipment such as amplifiers, woofers and tweeters, turntable or disk player; lighting; mirrors; records or compact disks; and the selection mechanism. In some cases, the bulk of the components are purchased from outside suppliers. Other manufacturers create everything in-house except the records or compact disks. Although many of the components are machine-crafted, each juke-box is hand-assembled at work-stations. 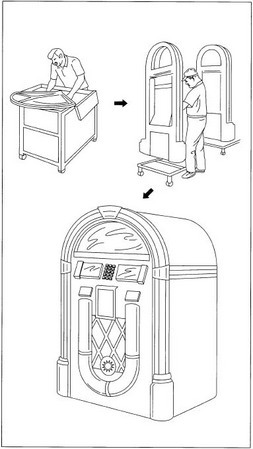 the jukebox is made on all its components prior to shipment. Since the late 1980s, the demand for new jukeboxes has remained steady. Collecting refurbished jukeboxes has also gained in popularity and is now a multimillion dollar secondary market. Aficionados created their own organization—American Historic Juke-box Society—and meet regularly at vintage jukebox shows around the United States. No doubt the jukebox is as American as apple pie, and while there is nostalgia for a time already past, there will also be a market for new and vintage jukeboxes. Bunch, William. Jukebox America. New York: St. Martin's Press, 1994. Barol, Bill. "The Wurlitzer 1015." American Heritage (September/October 1989):28. Boehlert, Eric. "Put Another Nickel In." Billboard (November 1, 1994): 92. Botts, Rick. "The Jukebox." Popular Machanics. (June 1995): 74. "Classic Jukebox Goes Mod." Design News (March 9, 1987): 30. Gustaitis, Joseph. "The Jukebox: America's Music Machine." American History Illustrated (November/December 1989): 44. Russell, Deborah. "Juke Biz Finds New Life Via New Technology, Markets." Billboard (October 19, 1991): 10. Webb, Marchus. "Classical Music: Antique Apparatus hits it big with reproductions of class jukeboxes." RePlay Magazine (January 1989): 113. Amusement & Music Operators Association (AMOA). 401 N. Michigan Avenue, Chicago, IL 60611-4267. (312) 644-6610. Fax: (312) 321-6869. Rock-OlaManufacturing Corporation. 2335 208th St., Torrance, CA 90501. (310) 328-1306. Fax: (310) 328-3736. http://www.rock-ola.com/ .